Guesthouse Raicho organizing Star and Moonlingt Night Snow Shoeing Guide Tour at Norikura Kogen, Japanese Alps. This is an original Guesthouse Raicho tour. Don your snowshoes and adventure out into the night’s winter forest. The tour guide will provide light, illuminating the beautiful frozen waterfall at night. ・5 days Before and after new moon, you can see the wonderful starry sky. Other time, we walk in the forest with beautiful moonlight. ・Downhill snowshoeing in the dark forest and dive to deep snow!! Tour starts from 19:00 or 19:30 and finishes 20:30 or 21:00. Min passenger count 2 person and Maximum 6 person. Private tour is available for Maximum 8 person. 3500yen per adult and 2500yen for the guests staying at Raicho. Private tour is available by additional 3000yen for group. Additional 250yen will be charged for insurance. 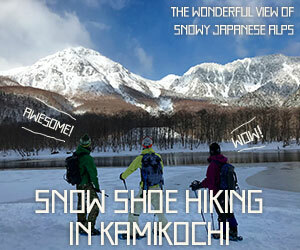 Guesthouse Raicho also organizes Kamikohchi snowshoeing tour and Norikura Kogen snowshoeing tour. For reservation for guesthouse and guide tour, please click below.